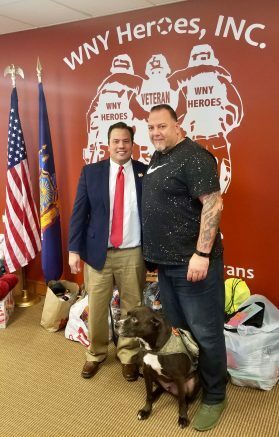 Erie County Comptroller Stefan I. Mychajliw Jr. delivers donations to WNY Heroes President/CEO Chris Kreiger for the Adopt-A-Hero Family Program. Erie County Comptroller Stefan I. Mychajliw Jr. and his staff supported WNY Heroes’ Adopt-A-Hero Family program to make Christmas a little brighter for one local family of six. Meeting with WNY Heroes President/CEO Chris Kreiger, an Iraq War veteran, Comptroller Mychajliw personally delivered donations and learned more about the agency’s year-round efforts. “During our tour of WNY Heroes’ Offices, people were constantly coming in with Christmas donations. That outpouring of support from the community was really nice to see. The room was packed with gifts that are sure to bring a smile to these veterans and their children. WNY Heroes deserves a great deal of credit for working so hard on behalf of veterans, not just during the holidays, but year-round,” said Comptroller Mychajliw. After dropping off donations for the military family adopted at Christmas by workers in the Office of Erie County Comptroller, Comptroller Mychajliw toured the WNY Heroes’ headquarters in Clarence. The agency helps veterans and their families through numerous programs and grants. WNY Heroes serves veterans from Buffalo to Rochester. The extent of WNY Heroes’ outreach far surpasses the borders of Erie County and includes diverse programs with numerous benefits for veterans and their families. Programs include Heroes’ Bridge to help pay for a veteran’s mortgage, rent and/or utilities; Pawsitive for Heroes to partner veterans with a service/therapy dog; William E. Kramp Scholarship for students; Adopt A Hero to support veteran families during the holidays; Operation Backpack to provide children of veterans or those still serving with backpacks filled with essential school supplies; Little Heroes provides financial assistance for extracurricular activities; Operation Automotive gives donated vehicles to veterans and Operation B.O.O.T.S. – Battle Buddies On Our Troops’ Side brings veterans and their families together for networking and friendship. “WNY Heroes honorably serves veterans 365 days a year. They are extremely dedicated to helping military members and their families live happy and healthy lives. These veterans more than deserve it for their service to the greatest country on Earth: the United States of America. I applaud the staff and volunteers for their hard work. We can’t thank our veterans enough. We should do everything we can to support them,” added Comptroller Mychajliw. Comptroller Mychajliw recognized the generosity of his staff for making this donation possible, especially Chris Musialowski and Kelly Terranova for leading the organizational efforts in the office to collect donations. Operating since 2007, the Adopt-A-Hero Family program assists 610 veterans and family members across 12 counties. With only a few days to go before Christmas, WNY Heroes is still collecting donations to help the family of a veteran this Christmas. Anyone who is able to adopt a family is asked to call 630-5020 for information. You can also visit their website: https://wnyheroes.org. Be the first to comment on "Comptroller’s office partners with WNY Heroes to fulfill Christmas wishes for veterans"